Long day, getting longer. I've accomplished quite a bit - crossed off a lot of my To Do list - but it's not all done. Need more sleep, so I'm quitting while I'm behind and will start again tomorrow. 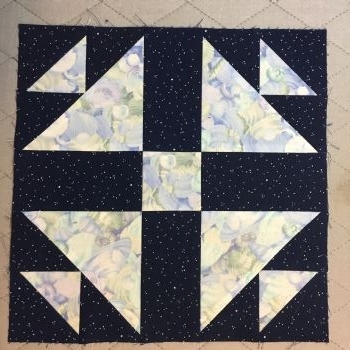 Today's block - Whirling Five Patch - isn't done as well as I would like, but I'm not changing it. It's a definite change after a month of Halloween and pink ribbon blocks. Back to blue and sea shells...I do like it. The first thought that came to mind was "Air Raid." Not sure why!